We reached Bijapur after driving for around two and half hours. It was already dark, but we found a few decent hotels to stay and quickly checked into one of them. The hotels were on the same street as the market, so parking spaces were in premium and noise was abundant. Realization about the noise came only after a few hours, and luckily the kind hotel manager agreed to shift us to another room farther from the road. Our experiences at Gulbarga had left us wiser and we stuck to as traditional an attire as we could so as to mingle as much as possible here. Remaining evening was spent shopping some fruits in the local market and dinner at a nearby restaurant. 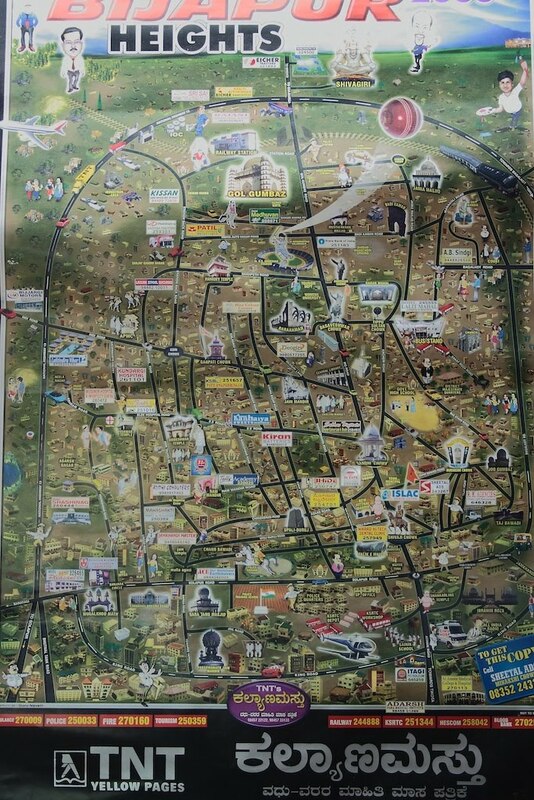 We found a nicely made rough scale local map at one of the shops that combined local service providers and prominent landmarks - sort of a birds eye view of the place. Gulbarga to Bijapur distance: 140 km. 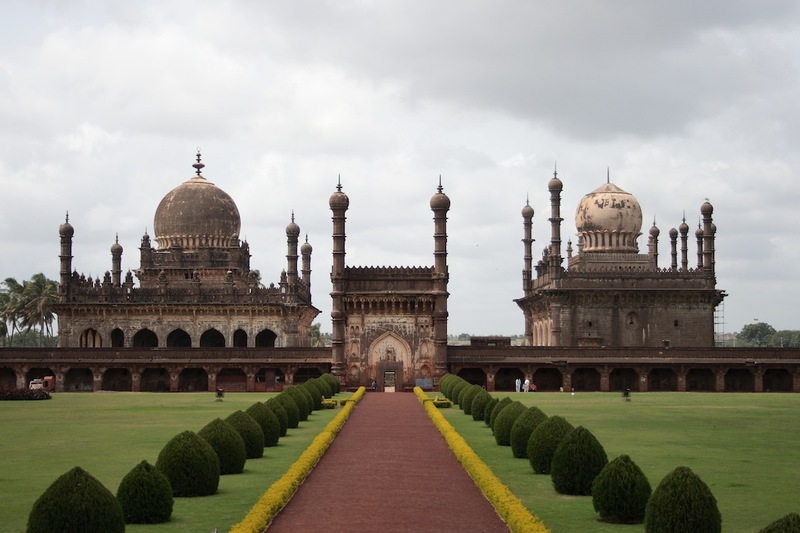 Bijapur was a province of the Bahamani Kingdom till its decline. The Adil Shahi dynasty ruled on Bijapur before it was ultimately assimilated into the Mughal empire by Aurangzeb. 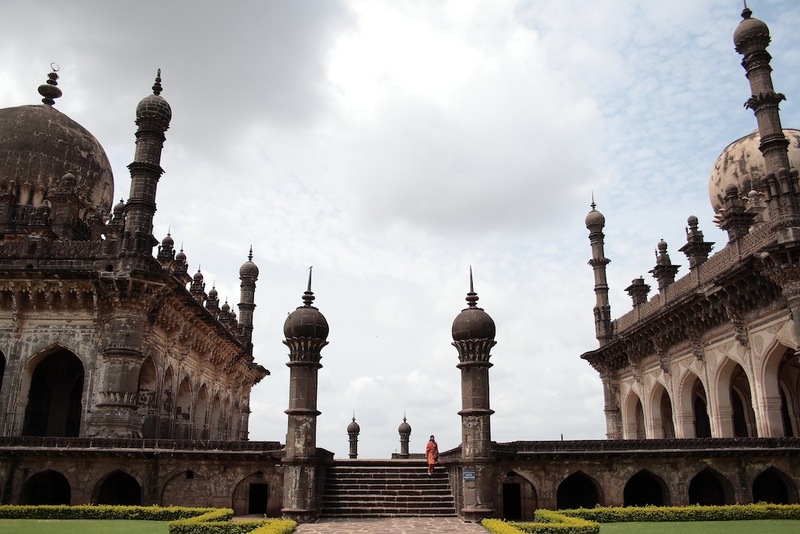 During its heyday Bijapur was a culturally rich and diverse city. 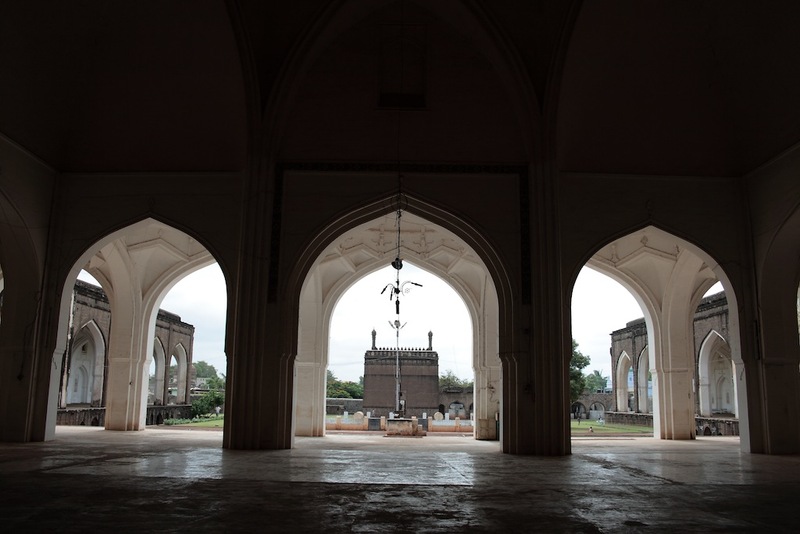 The Adil Shahi dynasty contributed many grand monuments to Bijapur that are still standing till date. 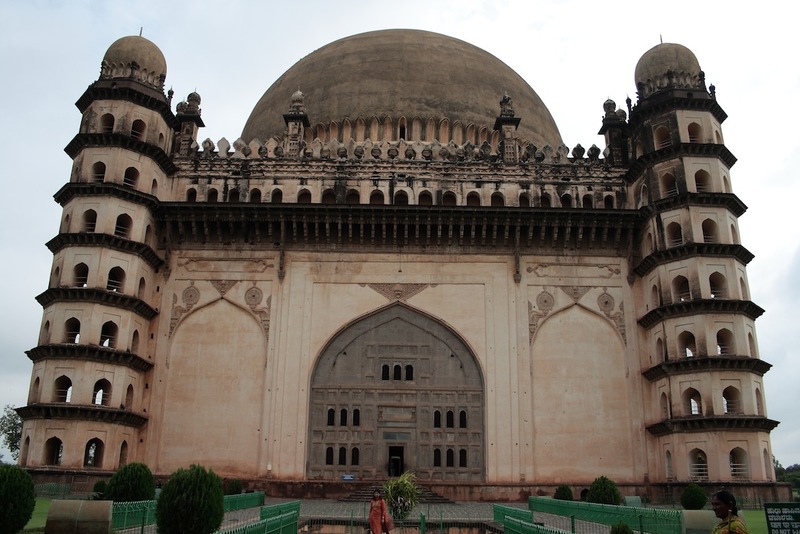 We started our day with the Gol Gumbaz. It is the huge tomb of Mohammad Adil Shah. In fact it is the worlds third largest dome (of historical significance) after Hagia Sophia in Turkey and the St. Peters Basilica in Rome. The inside of the dome has amazing acoustics. Loud noises produce beautiful echoes sustaining for as long as 10 times - expected of such structures. But what was surprising is that soft whispers are amplified and audible from all places around the dome. You would scratch your head wondering how you can hear someone at the opposite side of the dome scratching their head. It is said that the dome was used for music and dance performances for its acoustic properties. I can understand this from the amplification abilities of the dome, but I wonder how they would have managed with the echoes. 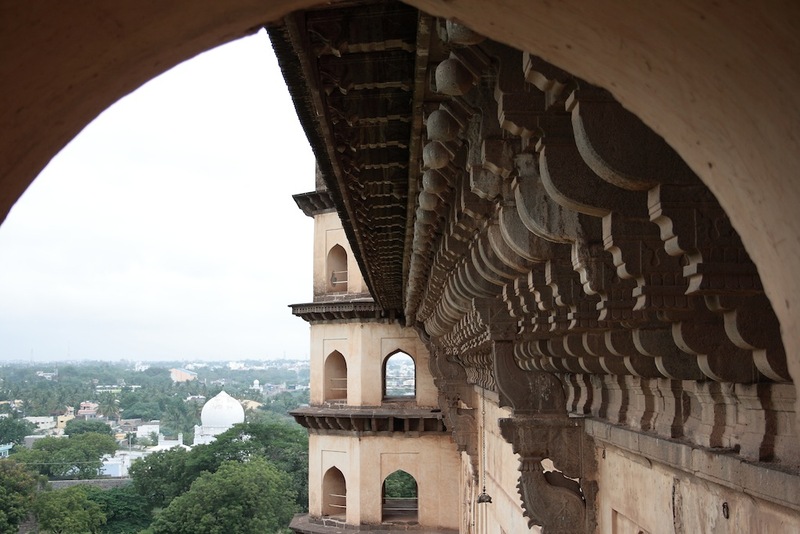 It is possible to climb to the top of the Gumbaz from where one can see the Bijapur city. 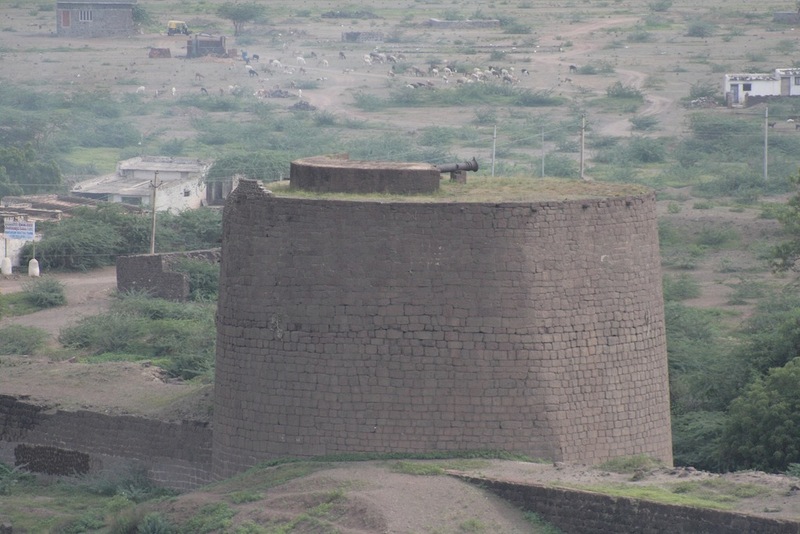 Also clearly visible are portions of the walls of the fort of Bijapur and its bastions with canons. 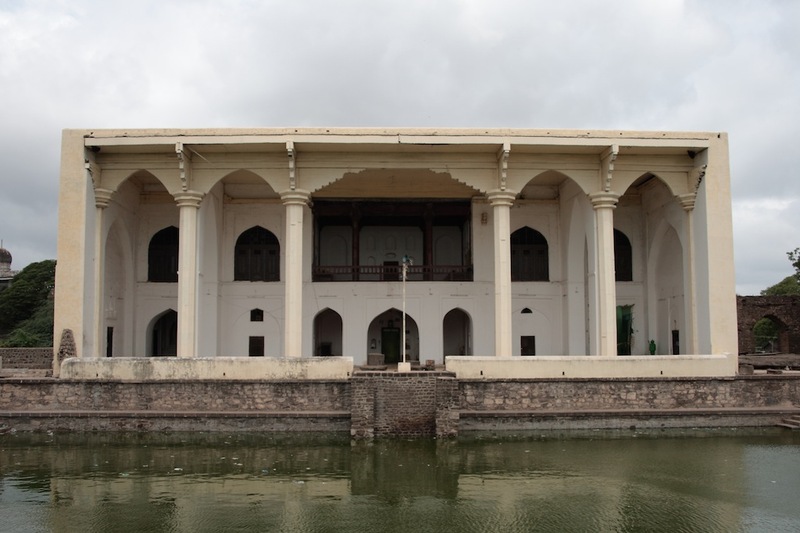 The surrounding of the Gol Gumbaz is a well maintained garden with a museum maintained by the Architectural Society of India (ASI). The museum was closed that day, but the garden was a relaxing place to laze around. Our next stop was the Jamia Masjid, which came after driving through quite a few narrow roads. There is a small clearing outside the masjid for parking. You need to keep your footwear outside before entering the mosque. This mosque has one of the most beautiful mihrabs (a decorated region in a mosque that points towards mecca and which people face while praying). The mihrab is gold plated and inscribed with persian verses. There is a large watertank in the middle surrounded by beautifully arched corridors. The Imam there was a nice old man who explained to us the history of the place and pointed us to different unique features of the mosque. Asar Mahal was the next place we visited. This ordinary looking structure holds one of the most revered items - a few hairs from Prophet Mohammed's beard. There is a beautiful lake in front of the mahal. Women are not allowed inside the mahal; though I could go leaving my wife outside, I was not terribly interested. We sat outside for some time and left for the next place - one that has been touted as the most beautiful place here. Ibrahim Rauza has starking resemblance to guess what... the Taj Mahal. And it is said that it did serve as an inspiration while building the Taj Mahal. There are six tomb stones inside the structure. From east to west they point to the graves of i) Queen Taj Sultana, ii) Mother of Ibrahim Adil Shah - II, iii) Ibrahim Adil Shah - II, iv) the daughter Zohra Sultana, v) & vi) the sons - Dharvesh and Sulaiman. What people are allowed to see are just the tomb stones. The actual grave with the bodies lie in an underground chamber beneath the tomb stones in the same order. One can walk below to get a glimpse of the underground corridors leading to the chambers, but the chambers themselves are closed. 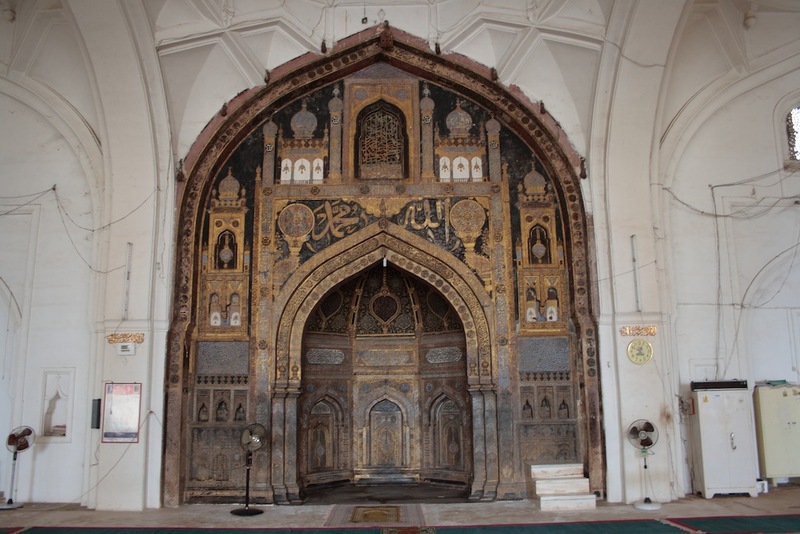 The tomb of the architect of this structure - Malik Sandal is also present in the courtyard. It was constructed at the cost of 1,50,900 Huns (an Adil Shahi gold coin); says the ASI information board. What is most beautiful about this place is the slender structures, the fine calligraphy on the walls and doors, and the striking symmetry. Thus ended our stay at Bijapur. We had planned to go towards Bagalkot next, but we decided against it and fixed our next destination at Hospet. We went back to our room, taking rest till the next morning drive to Hospet. Bijapur has special significance for me since i studied in Sainik school Bijapur. The guides told me that Ibrahim Roza was precursor to TAJ, your photos are revealing the same fact. would have been great if you could share a tiny review of the hotel you stayed in. @Deguide great to know that you studied there. You must be having a special connection to that place. @magiceye Thanks. I'll edit the post and put up some info on the hotel soon.